It was one linchpin of a concert that seesawed between facing mortality — full of songs about death — and a stubborn determination to live fully. Performing for more than two hours Mr. Mellencamp was as feisty about a bold middle age, in “The Real Life,” as he once was about wanting to “hold on to 16 as long as you can” in his biggest hit, “Jack & Diane,” from 1982. He doesn’t care about the past, he insisted, but wisely he hasn’t discarded it either. 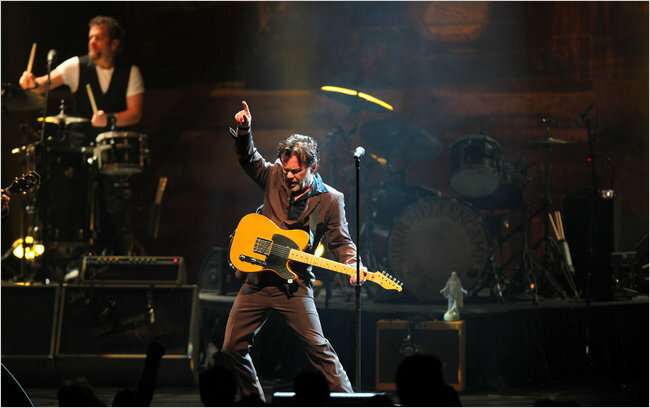 Mr. Mellencamp’s “classic hits” made him a multimillion-selling rocker in the 1980s. He built the persona of a populist bad boy: a small-town guy bucking authority and speaking up for also-rans. But Mr. Mellencamp wouldn’t act like a bad boy forever. He grew up fast. By the late 1980s he was singing, in his gutsy, earnest rasp, about adult disillusionment and economic woes, particularly for family farmers. He would go on to write about politics, racism, hard luck, faith and dying. Mr. Mellencamp also rusticated and backdated his music, adding folky instruments to his band and modeling his newer songs on Woody Guthrie, Johnny Cash and the blues. At Radio City Mr. Mellencamp changed his backup from song to song, juggling small groups and the full band. Sometimes he was alone with an acoustic guitar, strumming through “Small Town” with the audience shouting along, or he was joined by Miriam Sturm on violin and Troye Kinnett on accordion. Mike Wanchic, Mr. Mellencamp’s rhythm guitarist for 35 years, doubled on mandolin. Certain older songs were recast as rockabilly, with a swing beat from Dane Clark on a stand-up drum kit, John Gunnell slapping a bass, and twangy lead guitar from Andrew York. “Jack & Diane” got a countrified beat, and Mr. Mellencamp sang “Cherry Bomb” a cappella. Meanwhile some of the bare-bones songs from “No Better Than This” got fleshed out, like “The West End,” a chronicle of urban decay that became a dark drone, and “No One Cares About Me,” a litany of bitter isolation and stubborn optimism that took on a jaunty bounce. As the concert ended, Mr. Mellencamp stopped jovially dodging his past. His band’s Hoosier power chords were back for “Pink Houses” and “R.O.C.K. in the U.S.A.,” played in their old hit style. Still a populist, Mr. Mellencamp gave people what they wanted once he had his say. Excellent performance by John and the Band at Radio City. Throughly enjoyed all the new work and the reworks. Here's hoping he tours again and again. CenterStage) here's hoping the opportunity is there again.